Are Dixons Carphone shares worth 50% more than this? Areas of concern remain at Dixons, but the strategy is on track and the shares are tipped to keep rising. A slender rise in Christmas sales was just about enough to satisfy Dixons Carphone (LSE:DC.) followers today as CEO Alex Baldock passed his first major test since unveiling a new strategy for the electricals and phone retailer. Analysts at UBS said the chain had emerged from the peak trading season "unscathed" after posting a stable margins performance, which came alongside a slightly better-than-expected 1% rise in underlying sales for the 10 weeks to January 5. The broker, which believes Dixons Carphone shares have the potential to rise 54% from 143p currently to 220p following their sharp falls in 2018, highlighted a strong operational performance in areas such as online service and product availability. While full-year profits remain on track to meet the company's £300 million guidance, the latest update still shows areas of concern. Most pressing is the performance of the Carphone Warehouse mobile phone division, which posted a 7% drop in like-for-like sales for the period. Baldock said this was in line with expectations, impacted by a declining market for 24-month postpay deals. In contrast, electricals rose 2% following "stand-out performances" in televisions and smart tech. Sales in gaming, which is the first category to benefit from plans to bring more excitement to stores, surged 60% as the overall star performer. As part of Baldock's strategy unveiled last month, he has pledged to focus on "two big profitable growth opportunities" in online and credit and to revitalise the struggling mobiles business. He also wants to achieve £200 million of cost savings and an operating margin of 3.5% compared with 3% currently. The plan, however, has come at a price for shareholders after December's interim dividend was slashed 35% to 2.25p as part of a return to cover of three times earnings. Even after the reduction, the yield remains chunky at 7.3%. 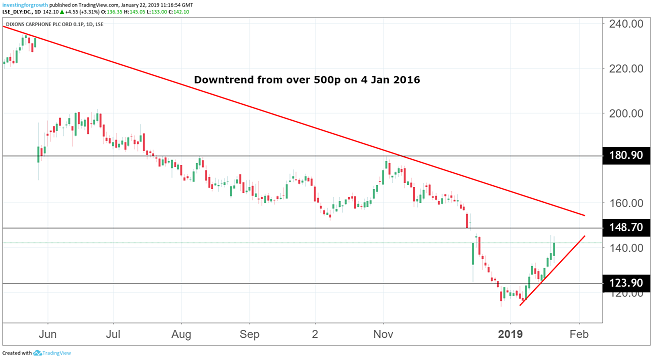 Shares fell as low 116p in late December, but have since recovered along with the rest of the retail sector after the Christmas trading season proved to be slightly better than feared in November and early December. But with its exposure to higher end products, as well as the current political and economic uncertainty arising from Brexit deadlock, the shares may remain embattled for some time yet. According to UBS forecasts, the company trades with a projected price/earnings (PE) multiple of just 6.8x for 2019. Its analyst Andrew Hughes praised the "good early progress" on the strategy implementation, especially the focus on service levels. 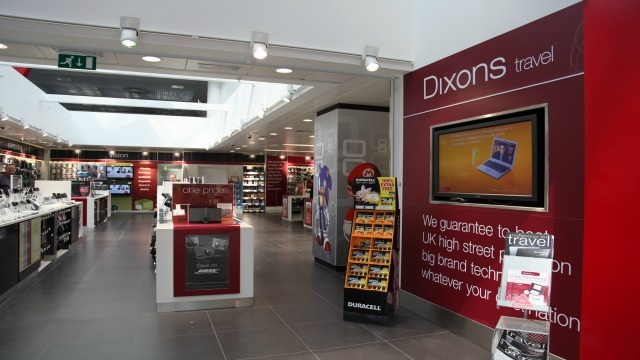 "Dixons seems to have come through peak unscathed and with strong operational performance. This give some comfort that Dixons can handle further channel shift and changes to the business model." In December's interim results, Dixons Carphone reported a bottom-line loss of £440 million after a raft of one-off items included a £225 million impairment charge for its UK and Ireland mobiles business. "It will take time and much hard work to unleash the true potential of this business, but we're getting on with it."